In recent years, the Arabic language has witnessed a gradual decline in the Arab world. Technological and scientific transformations, and the ensuing inventions and scientific advances in a multitude of fields, constitute a serious challenge to this language. This challenge is demonstrated through numerous aspects. The majority of new technological and scientific advances in the world are supported through languages other than Arabic; therefore, there is an increasing tendency in the Arab world to learn foreign languages, mainly English considering it is the language of science, and the language through which all forms of modern sciences can be learnt. Indeed, the scientific output in Arabic is almost non-existent in the fields of applied and experimental sciences, and very scarce in the fields of social sciences and the humanities. Moreover, publication activities in the Arabic language are very low when compared with other languages, as indicated in statistics published in 2005 by Egypt’s Supreme Council of Culture, stating that the Arab world publishes 1,650 books a year, while the US alone publishes 85,000 books a year. In his book Age of Science published in 2005, the late Egyptian scientist, Ahmad Zewail, a winner of the Nobel Prize in chemistry in 1999, said that the Arab world’s contributions to published scientific papers worldwide ranged between 0 per cent and 0.03 per cent, compared to 1.3 per cent for Israel. To this day, I believe that this percentage still accurately reflects the reality of the Arab world’s contribution to scientific publications, despite the 13 years that have passed since the book was first published. As a result of this minimal contribution to the modern sciences by Arabs, the Arabic language cannot keep pace with evolving scientific terminologies. Also, the translation of such terms into Arabic cannot, in many circumstances, convey accurately their meaning, which altogether drives specialists and scholars’ interest away from Arabic toward other languages. There is no doubt that Arabic language academies are exerting their efforts with regards to the translation and Arabisation of scientific terms; however, it is beyond their current capacities given the accelerating rate of scientific advancement, and the constant progress and expansion of scientific terms, which makes it very difficult for these academies to keep up with. In addition, the amount of Arabic content on the internet, which has become the principal platform for publication, sciences, culture, and information worldwide, is very insignificant when compared with other languages. In this context, it is estimated that Arabic content consists less than 3 per cent of the overall content on the web, which forces Arabs to use the English language, in particular, in order to follow all that is published on the internet, especially as most Arabic websites are of poor standards and do not offer content that can adequately compete with websites in other languages. Social media platforms are also viewed as a source of threat to the Arabic language, due to the hybrid languages employed by users of these platforms, including the use of Latin alphabets, numbers, or symbols to write Arabic [also known as Arabizi]. This hybrid, or invented language has gained popularity among younger internet users in particular. Arabic-language media is certainly shouldering responsibility for partly contributing to the deterioration of the Arabic language. Many Arabic-speaking satellite channels and newspapers were supposed to be promoting the language; however, they have been resorting to colloquial dialects and committing serious mistakes when using Standard Arabic, and thus have become a source of threat, rather than being a source of support. Furthermore, Arabic is also being undermined by the influx of foreign labour, primarily in oil-producing countries. These workers have introduced a wide range of non-Arabic words and have contributed to the advent of strange dialects that combine mainly Arabic and Hindi. Moreover, relying on foreign babysitters and housemaids, mainly Asians, to take care of children has been significantly detrimental to the use of Arabic language among the youth. Finally, the decrease in Arabic artistic output, including literature, theatre, cinema, among others, has led many Arabs, in particular the youth, to increasingly resort to foreign movies, series, and novels, which in turn further undermines the role of the Arabic language in shaping the consciousness and identity of the youth. Yet, is Arabic language responsible, in part, for this situation, or is it the Arabs themselves who are to blame? Some people blame the language itself, because of its difficulty and stagnation, as well as the outdated methods in teaching it. Thus, they claim that it cannot serve as a language of science. There is no doubt that I, like many other fervent advocates of the Arabic language, cannot agree with some of the previous claims. There is indeed a problem regarding the adopted methods to instruct Arabic, compared to other languages, which makes it hard to learn, consequently reducing its popularity. Moreover, Arabic curricula are outdated and are not evolving to keep abreast of modern developments. However, I would not agree that Arabic is by nature hard to learn or cannot serve as a language of science. If Arabic, which consists of 28 letters, is difficult, what would we say about Chinese, which consists of thousands of letters but attracts increasing numbers of foreign learners, including Arabs?! This is because the Chinese language has become necessary due to the country’s scientific and technological developments. Additionally, Arabic for many decades served as the language of science during the renaissance of Arab-Islamic civilisation. Several Arab scholars were distinguished in the fields of mathematics, medicine, chemistry, and philosophy, among others. Other nations learnt from them by translating their works from Arabic. There are also non-Arab scholars who made major scientific contributions in the Arabic language, during the glorious age of the Islamic civilisation. In light of all this, how can one say that Arabic cannot serve as a language of modern science? The strength of any language stems from the power of its people. As the scholar Ibn Khaldun once said, “The predominance of any language stems from the superiority of its people, and its status among other languages reflects the status of its country among other nations.” Thus, the weakness of the Arabic language can only trace back to the weakness of Arabs. During the ages of Arab progress, people in Europe and worldwide sought to learn Arabic and translate books of science and philosophy from the Arabic language to other languages, as mentioned before. The Arabic language was in a leading position, because Arabs were leaders; nowadays, it has declined, because of Arabs’ regression. Therefore, the Arabic language should not be blamed for the Arabs’ regression or for their failure to actively participate in modern civilisation. Certainly, there are meaningful efforts being made in the Arab world aimed at preserving, promoting, and reinforcing the Arabic language among younger generations. The UAE experience in this regard is worthwhile. Despite the country’s encouragement of openness to new languages and acquiring them, particularly as a prerequisite for learning the modern sciences, different cultures and civilisations, the UAE assigns great importance to the Arabic language. In this regard, I refer to the decision of the UAE’s Council of Ministers, in 2008, to authorise Arabic as the official language at all ministries and federal institutions and entities. There is also the Arabic Language Charter, announced in 2012, which aims to enhance its role and status within society. The UAE is exerting efforts to teach Arabic to non-Arabic speakers, and to hold conferences pertaining to the promotion of the Arabic language, mainly the International Conference for Arabic Language which is hosted annually in the UAE. There are also several activities and initiatives, the most recent of which is the Madrasa platform, launched on October 16, 2018, by His Highness Shaikh Mohammad Bin Rashid Al Maktoum, Vice-President and Prime Minister of the UAE and Ruler of Dubai. This online educational platform gives students access to 5,000 educational materials in Arabic, covering a multitude of subjects relevant to school stages starting from kindergarten to grade 12. 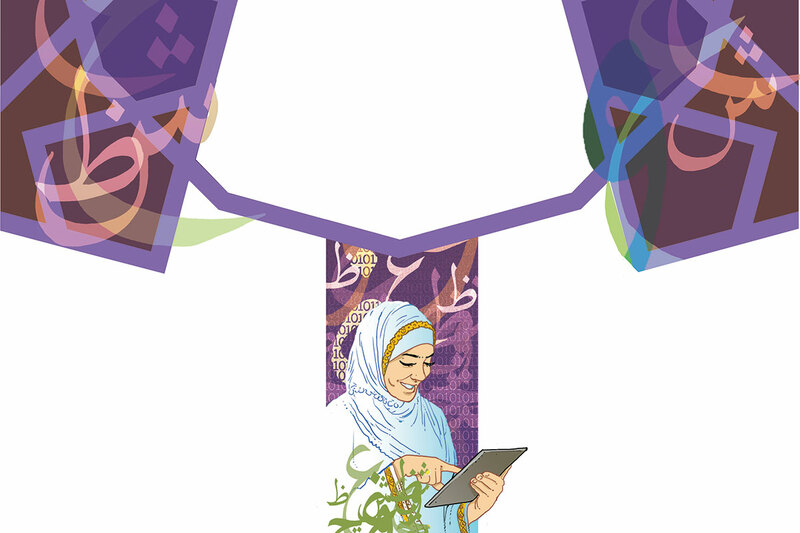 The platform targets millions of Arab students around the world and seeks to enrich Arabic content on the internet. At the Emirates Centre for Strategic Studies and Research (ECSSR), I have always sought to promote the Arabic language throughout the Centre’s activities and publications, ensuring that these Arabic publications are written in a correct and eloquent language. In 2008, the ECSSR held a specialised conference on the Arabic language titled “Arabic Language and Education: A Futuristic Vision of Development.” In addition to the UAE’s efforts, many Arab countries play a key role in preserving the Arabic language, through their universities and specialised institutions; yet, the path to reach the desired goals is still very long; and the promotion of Arabic language requires coordinated, relentless, and enormous efforts as well as a comprehensive vision that is shared among Arab countries. There is no denying that the Arabic language is exposed to serious and increasing risks, and I believe that were it not for the Holy Quran, the Arabic language would have been in a more critical situation. Don’t leave me to the torments of life, for fear you may lament my demise. Dr Jamal Sanad Al Suwaidi is a UAE Author and Director-General of the Emirates Centre for Strategic Studies and Research.